Can’t find a Grenada Hotel that meets your expectation of privacy and affordability? Well forget about hotels and look no futher than Sunrise Villa. This three bedroom property sleeps up to 6 guests and is located in beautiful Fort Jeudy on Grenada’s sought after Southwest Coast. 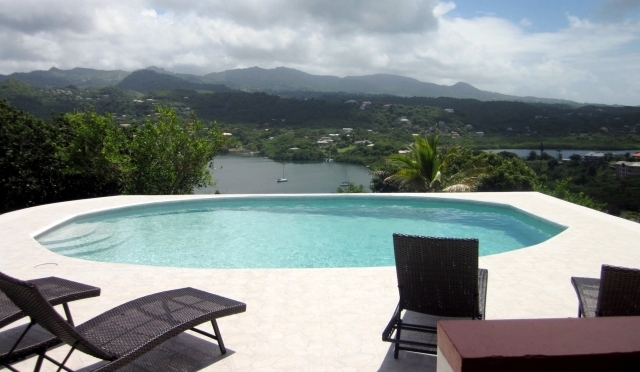 Skip below to see pictures of this Grenada Villa or to request rates and availability. One of the most remarkable benefits of staying at Sunrise Villa is it’s spectaular views of both the Atlantic Ocean, and Grenada’s lush green interior. That ocean blue, and forest green contrast is signature Grenada, and hard to resist when combined with all the other great things Sunrise Villa offers. The Fort Jeudy neighborhood is within 20 minutes drive of the most popular beaches (Grand Anse Beach, Morne Rouge Beach), shops, and night life Grenada has to offer. Fort Jeudy is also one of the priciest pieces of real estate in Grenada. Many of the homes are owned by foreign based Grenadians, expats, and successful Grenadian professionals and business owners. You will enjoy the same privacy and ambiance that these homeowners have come to expect from this lovely coastal community. Four bedrooms and four baths. Open plan living, dining, kitchen and family room. This is a perfect home for 2, 4, or 6 guests. It has everything you need to feel at home in the islands. For Rates, Availability or Other Questions? Just fill in the short form below with your name, and any questions or comments you might have. And we will get back to you immediately. Be sure to triple check your email address. Thanks for stopping by, good luck, and enjoy Sunrise Villa, Fort Jeudy and your Grenada Vacation. ***Side Note: I hate SPAM and junk email with a passion, that’s why I avoid listing contact email addresses on the website. Filling in a web from is a better solution, it’s quick and spammers won’t get your email. You can also rest assure that we will never share your email address with anyone. Next post: Where is Grenada (the island) On The Map?